The territory of the touristic area of Assisi, also including Bastia Umbra, Bettona and Cannara- occupies the northern part of the Umbrian valley, bounded to the North East by Mount Subasio and to the South East by the hills that separate it from the Tiber Valley. It is crossed by various water courses (the Chiascio - a tributary of the Tiber, the Topino, the Ose and the Sambro), whose waters make the beautiful countryside fertile. Assisi, situated in one of the most characteristic spots in Umbria on a spur of Mount Subasio is an obligatory stop on the international tourist trail for a multitude of reasons of a religious nature or otherwise. Things to see: Basilica of S. Francesco and the Holy Convent, the Basilica of S. Chiara, the Cathedral of S. Rufino, Church of S. Stefano; Pinacoteca Comunale, Church of S. Giacomo de Muro Rupto; Church of S. Maria Maggiore, Church of S. Pietro; Galleria d'Arte Sacra Contemporanea della Cittadella Cristiana; Fonte Marcella; Rocca Maggiore. S. Maria degli Angeli (5 Km) - It encloses the Porziuncola, the Chapel of the Transit. S. Damiano (1.5 Km), Hermitage of the Carceri (4.5 Km) - Sanctuary of Rivotorto (4.5 Km), Abbey of S. Benedetto al Subasio (7 Km) - Rocca S. Angelo (11 Km) - San Gregorio (13 Km), Tordibetto (5 Km) and Armenzano (11 Km) BASTIA UMBRA (201 m. above sea level). The ancient Insula Romana, today, a thriving agricultural, industrial and commercial town, the site of Umbriafiere where important exhibitions and fairs of a national character are held. All that remains of the mediaeval village is the Porta S. Angelo. Near the cemetery is the Romanesque Church of S. Paolo. The restored Church of S. Rocco houses a standard by the painter Dono Doni of Assisi. Bettona(355 m. above sea level) is a thriving agricultural town, it boasts very ancient origins. Things to see: the Etruscan hypogeum of the 2nd century B.C. in the hamlet of Colle the Umbrian-Etruscan city walls. The main monuments are: the 15th-century Palazzetto Podestarile housing an interesting Picture Gallery (works by Fiorenzo di Lorenzo, Perugino, Tiberio di Assisi and Dono Doni); the Church of S. Maria with paintings by Perugino, by N. Alunno and the Sienese school and the futurist Gerardo Dottori; the Church of S. Crispolto; the Oratory of S. Andrea; the Oratory of S. Onofrio. Cannara(197 m. above sea level) It is a town of ancient origins with an economy based mainly on agriculture, fairly well-developed thanks in part to the waters of the River Topino whose left bank borders the town; things to see: the Town Hall, the churches of S. Biagio, S. Francesco, della Buona Morte and S. Sebastiano. Just over a kilometre from the town we come to Pian d'Arca, a place linked to St. Francis' sermon to the birds, made famous by Giotto's fresco in the upper Basilica in Assisi. Collemancio (Urvinum Hortense) is located 7 Km from Cannara there is a delightful mediaeval village, whose ancient appearance is still intact. Here, excavations carried out at various times have brought to light the remains of pre-Roman and Roman settlements. The city of Assisi rises on the western slopes of Mount Subasio from where it dominates a very fertile plain. In the centre of the plain the imposing structure of the Basilica of St. Mary of the Angels is silhouetted against the horizon. Assisi is known as the city of Peace and the ecumenical meeting place of world religions. Assisi¹s s mera">dieval aspect has remained intact and is characterised by its typical white and pink stone. Visitors to Assisi can perceive the intensity of the Franciscan spirituality and that of the other great saints who have blessed this land. Assisi, like many Umbrian municipalities which where situated in strategic locations of economic or military importance, had to endure over many centuries, a series of invasions, occupations, pillage, civil struggles, destruction and reconstruction. 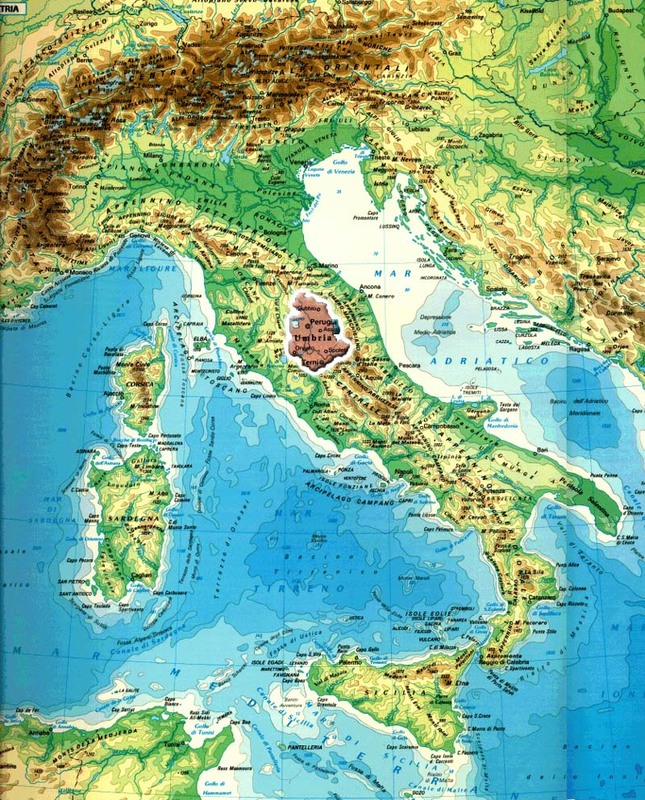 The Umbrians, who founded Assisi, were succeeded by the Etruscans. The Etruscans were driven out by the Romans and in the 1st century b.C. Assisi becomes a Roman municipality and lives a period of peace and prosperity until the fall of the Roman Empire. In 545 a.C. Assisi, which had already been converted to Christianity by the works of its first Bishop Rufino, is attacked and destroyed by the Goths of Totila. 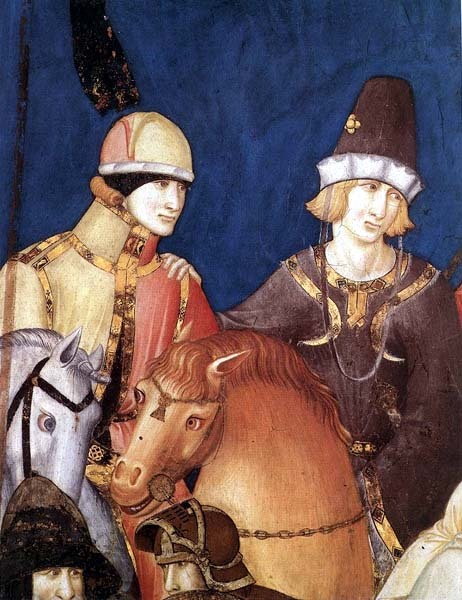 The Goths are succeeded by the Longobards whom incorporate Assisi into the Duchy of Spoleto. The typical turbulent events of the Early Middle Ages then follow, until the 11th century when Assisi becomes an independent municipality. AssisiÕs independence does not last long. In 1174, Federico Barbarossa subjugates Assisi. In the years that follow Assisi fights continuous battles to defend its independence against the Empire, the Papacy and against Perugia and other cities close-by. 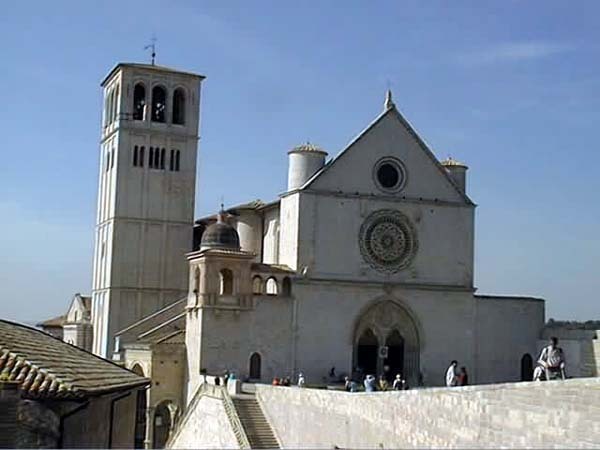 At the end of the 11th century, 2 great saints are born in Assisi: Francis (1182) and Clare (1193). The political and military instability continues until the 16th cent. when, after many dominating groups (Papacy 13th and 14th cent. ; Gian Galeazzo Visconti  1400; Braccio Fortebraccio  1419; Francesco Sforza  1430) Assisi becomes part of the Papal State (with the exception of the Napoleonic period). Assisi remains under the rule of the Papal State until 1860, when it becomes part of the Kingdom of Italy. The Basilica complex is composed of two churches built one above the other, the lower one dating from 1228-1230 and the upper one from 1230-1253 and a crypt dug in 1818 which houses the Saint¹s tora">s to mb. The lower Basilica was decorated by the greatest painters of the 13th and 14th centuries: Cimabue, Giotto, Lorenzetti brothers and Simone Martini. The stained glass windows are specially beautiful. The Upper Basilica is adorned by Giotto¹s frescos illustrating the life of St. Francis. There are also works by Cimabue, Cavallini and Torriti. The monastery houses a remarkable ³Treasury² composed of rare illuminated manuscripts and the Perkins collection. Saint Francis was baptized Giovanni Battista, but called Francis, he was born in Assisi in 1182 to Pietro Bernardone and his wife Giovanna. After a brief military experience, he started to devote himself to a life of prayer, and in 1206, praying before the crucifix of the damaged church of St. Damiano, Francis hears the divine exhortation to reconstruct the Church. After renouncing his inheritance and father's goods, by begging alms, Francis repaired the churches of St. Damiano, St. Pietro of the Spina, and the Porziuncola, and devoting himself subsequently to the care of the lepers. The first followers joined him in 1208. The next year, Pope Innocenzo III orally approved the Rule of Life that Francis and his first twelve companions submitted to him. Returning to Assisi, they settled at Rivotorto in an abandoned pastoral shelter. They remained there a few months and moved to the Porziuncola. After an intense apostolic activity in Italy, in 1219 Francis went to Egypt with the Fifth Crusade, to announce the Gospel to the Saracens, trying to convert the sultan Malek-el-Kamel. On November 29 1223 Onorios III with the bead Solet annuere, formally approved the Rule of Francis, confirming the fraternal institution. At Christmas of the same year, Francis prepared, according to formalities approved by the pontiff, the first representation of the Christ Manger at Greccio. The following year, at the peak of his ascetic and mystical walk experience, on the mountain of the Verna, Francis received the Stigmata. In 1225, despite a serious illness that left him nearly blind, Francis composed the Canticle of Brother Sun. The next year, very gravely ill, Francis dies at the Porziuncula on October 3, 1226. He was buried in the church of St. George, where he remained until 1230, when his body was moved to the Basilica dedicated to him. In Via S. Francesco, there are the 13th century House of the Maestri Comancini, the Oratorio dei Pellegrini (with 15th century frescos) and the Monte Frumentario (13th century). In Piazza del Comune, you will find the Roman Temple of Minerva (dating from the 1st century B.C. ), the 13th century Palazzo del Capitano del Popolo, the Torre del Popolo, completed in 1305, and the Palazzo dei Priori (14th century) with the Municipal Art Gallery (Pinacoteca Comunale) containing frescoes from various schools. The Roman Forum is located below the Piazza del Comune and emcompasses the orginal Roman paving and the base of the temple of Minerva. Chiesa Nuova was built in 1615 on the remains of a building believed to the house of St. Francis¹ Family. St. Francis was supposedly born in the nearby Oratorio di San Francesco Piccolino. The Basilica of St. Claire is an extraordinary example of Italian Gothic architecture. It was constructed between 1257-1265 and contains precious paintings dating from the 12th to the 14th century and the famous Crucifiz venerated by St. Francis at San Damiano. The body of St. Claire is preserved in the crypt. The Cathedral of San Rufino is an impressive Romanesque façade dating from 1140. It is adorned with three rose-windows and symbolic sculpure. The interior was altered in the 16th century, but there is still the baptismal font where St. Francis and St. Claire were baptized. The Cappella del Sacramento, the wooden choir, the Roman Cistern, the crypt and the museum are points of interest. Other important monuments are: the Church of Santo Stefano (13th century) in one of the most of the picturesque corners of the town; the Romanesque Church of Santa Maria Maggiore, first cathedral of the town; the church of San Pietro with its elegant façade and original dome; Fonte Marcella (XVI century); the Rocca Maggiore, typical example of medieval military architecture; from the top the breathtaking. 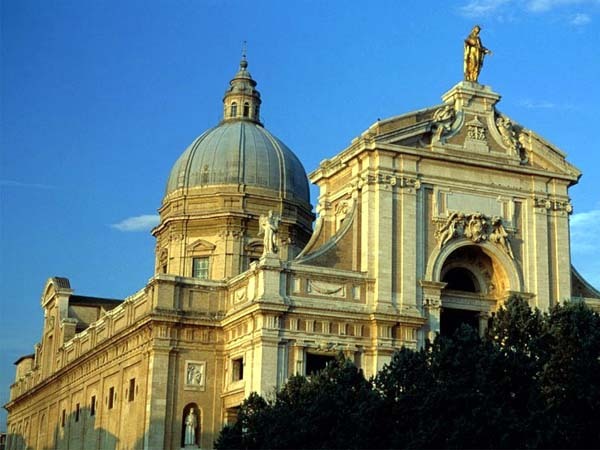 Santa Maria degli Angeli is located in the suburb of Assisi, about 5 km away and boasts an imposing basilica constructed between 1569 and 1679 and crowned by Alessi. 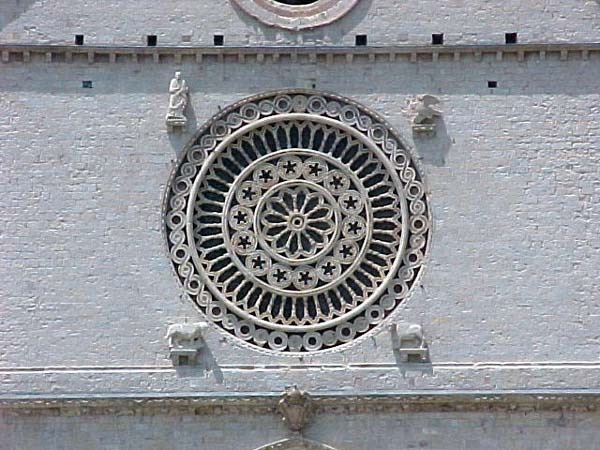 It encloses the Porziuncola (the nucleus of the first Franciscan monastery and the place where St. Clare received the Franciscan cowl from St. Francis in 1211) and the Cappella del Transito where St. Francis died on 3rd October 1226. To the side of the basilica in the Chapel of the Roses with frescoes by Tiberio d¹Assisi. The Museum annex contains works by the Maestro di San Francesco, Giunta Pisano and others. San Damiano is a franciscan shrine about 1,5 km from Assisi, built on the spot where St. Francis heard the voice of Christ and where he wrote the Canticle of the Creatures. The Convent founded by St. Claire is still intact. The Hermitage (Eremo delle Carceri) is an oasis of peace and tranquillity in the midst of the woods of Mt. Subasio (4,5 kms from Assisi). The Abbey of San Benedetto on Mt. Subasio in an ancient Benedictine settlement is located about 7 kms from Assisi with two Romanesque crypts. At Rocca Sant¹Angelo (11 kms from Assisi), there is an old Franciscan monastery. In its church are paintings by followers of Giotto and painters from the Umbrian school.